I was so thoroughly immersed in this story, I had trouble putting it down. This is another book which has two main characters, Romy and her granddaughter, Alexandra with dual time lines, the present, and the past, set during WW2. We are transported back to a time when Romy as a young Jewish girl escapes Austria in 1938 with her family and finds refuge in Shanghai where she grows up forming close friendships with a Chinese girl, Li and fellow Austrian, Nina. Their world soon changes with the occupation by the Japanese and the consequent liberation by the Americans, forces Romy to take drastic action to survive. Alexandra is a trader who comes home broken hearted from a love affair in London for the funeral of her grandfather. We learn that Alexandra was brought up by her doting grandparents when her adopted Chinese mother and Australian father were killed in a car accident when she was a toddler. She begins digging into family secrets which Romy has withheld from everyone including her own husband. I’d read nothing about Shanghai during the war and this was a well-researched and fascinating piece of history. Thousands of refugees escaped Europe and found a life in Shanghai until the Japanese took control. The atrocities by the Nazi’s and the Japanese is brutal but not overdone. The mix of cultures in the melting pot of Shanghai’s diverse population was described brilliantly as was the description of its architecture both in modern and historical contexts. Chinese medicine features strongly giving readers further information about its healing properties, both physical and mental. The characters are well drawn and strong women in their own right with a love for each other which is heartfelt and touching, particularly toward the climax of the story. The historical details are weaved appropriately using the dual timelines which works really well. There is something for everyone in this story of love, loss and survival against all odds. 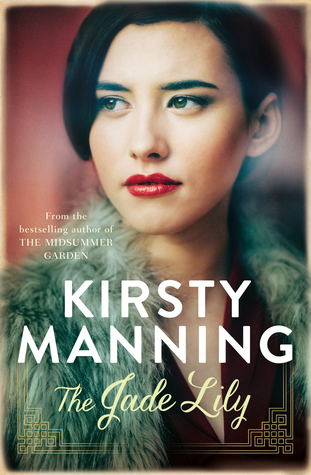 It’s a page turner by Australian author Kirsty Manning and you won’t be sorry getting hold of this one. This entry was posted in Book reviews and tagged australian authors, Book reviews, books, books by women, buy a book, historical fiction, Japanese occupation, Reading, WW2 on July 30, 2018 by S.C. Karakaltsas. I began telling friends about my project. I was surprised they were interested – they wanted to know more. “In the middle of the Pacific,” I happily answered. But that meant nothing to anyone. “You know, Nauru?” I said. Everyone knows about Nauru but only because of the emotional and raging debate against Australia using it to house asylum seekers. “Well, it’s near there. About a hundred or so kilometres to the east,” I said confidentally.But I knew very little else. I thought I’d better find out a bit more and the internet enlightened and surprised me. I read one reference from a fellow to the question, ‘where is Ocean Island’ and he replied, “All over Australia mate.” What did he mean? I soon found out. In the early 1900’s, Nauru had been in the hands of the Germans who mined phosphate. Albert Ellis, a young New Zealander discovered that there was tons of phosphate on nearby Ocean Island and placed a stake on behalf of the British. He negotiated with the island chiefs and paid them fifty pound a year and promised to bring in water. The islanders or Banabans ( as they were known) thought it was a great deal considering that most of their number had been wiped out from the last long drought some years before. So at the turn of the century, mining commenced and didn’t stop until the phosphate was virtually gone in 1979. 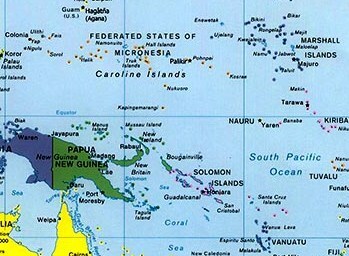 During that time, Australia managed Nauru and Ocean Island jointly with New Zealand and Britain. When the First World War broke out, the British secured Nauru from the Germans and the Australians mined it too. However,during the Second World War the Australians abandoned both islands when the Japanese advanced and occupied most of the Central pacific region. The islanders were treated harshly and most of the Banabans were dispersed across the other nearby islands. Food was scarce and death was the norm at the hands of the Japanese. 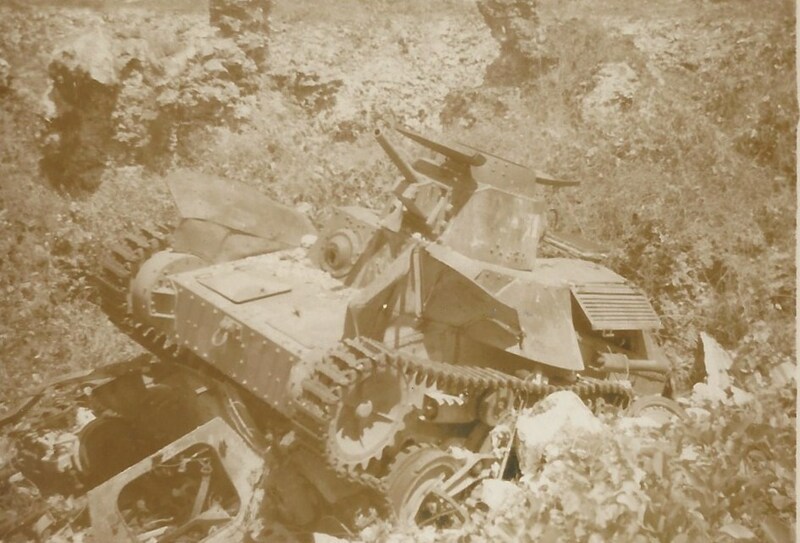 My father must have been touched by the site of old Japanese tanks left abandoned around the island. This is a photo he took in 1948. Today, Banaba as it is now known, belongs to Kirabati, one of the poorest nations on earth. You can just make out the speck called Banaba near Nauru on the map above. Now largely abandoned with an ecological disaster on their hands, a small number of native Banabans try to eek out a living. The rest of their people live on Rabi, an island bought for their relocation in 1945 – some hundreds of kilometres away in Fiji. So what is phosphate used for? It was mined and brought back by ship and used primarily by our farmers as fertiliser. My curiosity and excitement about this island was growing. I was drawn to the place and its history and the experience my father had in the twelve months he was there. In the back of my mind, the threads of a story was brewing. I wasn’t a writer I told myself. I didn’t know what I was going to do or how this project was going to unfold, but I knew I had to push on. This entry was posted in Writing and tagged Banaba, Japanese occupation, mining, nauru, Ocean Island, WW2 on June 3, 2015 by S.C. Karakaltsas.